clusters for the same TF revealed by different peak calling methods were joined into metaclusters. de novo putative protein-DNA interactions were revealed using a digital genomic footprinting tool Wellington. GTRD database is freely available for non-commercial organizations. GTRD uses 17485 ChIP-seq experiments corresponding to 2399 UniProt IDs. Most of ChIP-seq experiments (79.2%) have corresponding control experiments. In average, each TF has been measured in 7.28 ChIP-seq experiments, 52% of TFs have been measured in more than one experiment. GTRD contains 843 DNase-seq experiments. The metadata concerning GTRD is stored in MySQL tables. Web interface to GTRD is available here. It provides capabilities for searching and browsing GTRD. 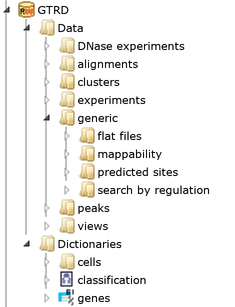 Start page contains search boxes and the links to browse all experiments in the repository tree, documentation, help (wiki pages) and transcription factor classification tree. The ChIP-seq experiments contained in GTRD can be queried from the search box on the Start page. GTRD uses Lucene engine for indexing and quering ChIP-seq experiments that provides rich syntax for searching. The search can be performed by transcription factor(name or UniProt ID), cell line, antibody or treatment/conditions. "Genome-wide profiles of STAT1 DNA association using chromatin immunoprecipitation and massively parallel sequencing." The list of matching ChIP-seq experiments will appear in the 'Search result' tab. Select one of them to view detailed ChIP-seq experiment information in the information box. The information box also provides links to the experiment data: reads, alignments and peaks. To view peaks or alignments click the link in the ChIP-seq experiment information box, the track will be opened as table. The track can be exported by pressing 'Export' button or opened in the genome browser by pressing 'Open as track' button in the general control panel. GTRD is organized in hierarchical Repository. This page was last modified on 23 October 2018, at 10:51. This page has been accessed 64,927 times.